The Skeleton Queen rules over all the creepy creatures in the kingdom. Ghouls, goblins, vampires, pumpkin people, you name it, the Skeleton Queen is in control of all of them. While she may be the ruler of all things underworld, she also has a fierceness about her that makes her capable of rolling with the best of them in the natural world. She may not be a CEO or runway model, but she takes care of business when it comes to managing her underlings, which makes her the envy of many. When she’s not ruling her minions, she’s catching up on world events and hanging out at posh parties in the Hamptons – I mean, a Skeleton Queen has to be cultured, right? She wouldn’t be able to rule with a bony fist if she wasn’t up to date on the next presidential election! Not only is the skeleton queen menacing, her hauntingly fierce fashion sense will make pulses race. 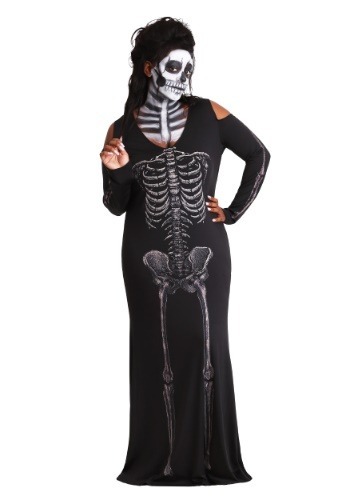 Be the one all the wicked creatures bow to when you wear this Women's Plus Size Bone Appetite Skeleton Long Dress. The dress is a pullover maxi-style dress that has shoulder cutouts for added drama. The all-over printed skeleton graphic is essential for giving the Skeleton Queen her from-the-grave look. And, to top it off, the bones are glow-in-the-dark for an added element of scariness. Combine this skeleton costume with a skeleton face makeup kit, a pair of skeleton or black gloves, and a pair of black Mary Jane shoes for a look that is complete and fierce from head-to-toe.